Puna Candidates Jen Ruggles, Danny Paleka, Madie Green, and Eileen Ohara meet to discuss issues of Puna. 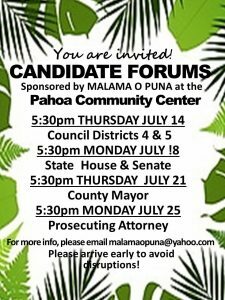 This Thursday, July 14 at 5:30pm the non-profit organization Malama O Puna will host a candidate forum at the Pahoa Community Center. This will be the second Hawaii County Council District 5 candidate forum held this election 2016 season. To see the first district 5 forum held at Hawaii Academy of Arts and Science click here. “I am looking forward to this forum. Mahalo Malama O Puna for providing residents of Puna the opportunity to get to know their candidates,” Ruggles said. Because Malama O Puna is an environmental nonprofit, its board will select the first three to five questions. They will not be yes-no questions, but will require knowledge of the issue and allow the attendees to gain an insight into the thinking of the candidate. The next phase of the program will open the floor to questions from the audience until 8 p.m., when the event ends. In the first forum candidates addressed the styrofoam ban, government corruption, and emergency access roads. The Thursday forum will be followed by a Hawaii State House and Senate forum on Monday 7/18, a mayoral forum on 7/21, and a forum for prosecuting attorney on Monday, 7/25. All forums begin at 5:30. Please arrive early to avoid disruptions. For a link to the Facebook Event click here.